De Quervain tenosynovitis is an irritation of tendons that run from the wrist to the thumb. These tendons pass through a tunnel-like tissue, called a sheath, at the wrist. The tunnel area can cause additional pressure and irritation on thickened or swollen tendons, making normal movements painful. De Quervain is caused by pressure on already irritated tendons as they move through the sheath at the wrist. 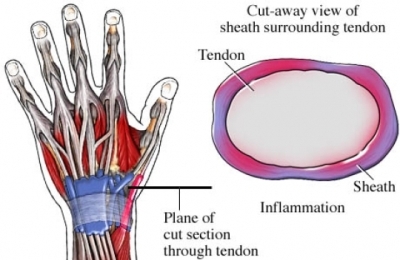 The irritation of the tendon may be caused by repetitive movements of the thumb and wrists or a direct blow to the area. You will be asked about your symptoms and medical history. A physical exam will be done. You will be asked to move your fingers and wrists in different ways to help make the diagnosis. Your may be asked to make a fist with your thumb inside your fingers and bend your wrist toward your little finger. If this causes pain at the wrist below your thumb, you may have de Quervain tenosynovitis. If supportive care is not helpful, then cortisone injections may be advised to reduce swelling. If injections are not helpful, then surgery may be advised to open the tunnel that the tendon passes through. Best treatment for de Quervain's tenosynovitis uncertain. Am Fam Physician. 2003;68(3):536. Corticosteroid injection for treatment of de Quervain's tenosynovitis: a pooled quantitative literature evaluation. J Am Board Fam Pract. 2003;16(2):102-106.
de Quervain syndrome. Merck Manual for Health Care Professionals website. Available at: http://www.merckmanuals.com/professional/musculoskeletal%5Fand%5Fconnective%5Ftissue%5Fdisorders/hand%5Fdisorders/de%5Fquervain%5Fsyndrome.html. Updated November 2016. Accessed March 26, 2018.
de Quervian tendinitis (de Quervian tendinosis). Ortho Info—American Academy of Orthopaedic Surgeons website. Available at: http://orthoinfo.aaos.org/topic.cfm?topic=A00007. Updated December 2013. Accessed March 26, 2018. De Quervain’s tenosynovitis. EBSCO DynaMed Plus website. Available at: http://www.dynamed.com/topics/dmp~AN~T115729/de-Quervain-tenosynovitis. Updated April 28, 2017. Accessed March 26, 2018. Johnson CA. Occurrence of de Quervain's disease in postpartum women—pain and tenderness in wrist. J Fam Pract. 1991 Mar;32(3):325-327. 4/30/2014 DynaMed Plus Systematic Literature Surveillance http://www.dynamed.com/topics/dmp~AN~T115729/de-Quervain-tenosynovitis: Petit Le Manac'h A1, Roquelaure Y, Ha C, Bodin J, Meyer G. Risk factors for de Quervain's disease in a French working population. Scand J Work Environ Health. 2011 Sep;37(5):394-401.